Wormholes are bizarre things. Bizarre things which may not actually exist (although in theory, there’s no good reason why they shouldn’t). Predicted by General Relativity, the concept is actually quite simple. If you imagine a Universe in just two dimensions, then it could conceivably fold over itself, or it may even be lying on top of another 2D Universe. It it were possible to tunnel between the two (via the third dimension in this case), you could quite easily traverse impossible distances in a relatively short space of time, using a Lorentzian Wormhole (also known as an Einstein-Rosen bridge). Theoretically, anyway. You wouldn’t violate Relativity either, because locally, you wouldn’t be exceeding the speed of light. The trouble with the theories is that, as you might know, trying to make Quantum Mechanics and General Relativity work together is a bit like trying to use a UK plug in a US socket to power your laptop. Both work perfectly well, but they don’t work together. 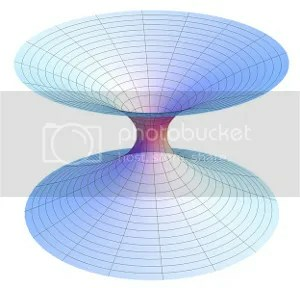 One of the biggest problems is that Relativity predicts spacetime to be curved. No one really seems to know a lot about how Quantum Mechanics will work in curved spacetimes, which is bizarre, because it might open up a whole world of knowledge about weird things like wormholes. Fascinatingly, a recent paper bu Rossen Dandoloff suggests that wormholes might contain some very strange effects, at least for quantum particles like photons and electrons. Specifically, a new type of force hitherto unknown to Physics. He starts with Heisenberg’s Uncertainty Principle, which states that it’s impossible to know both the momentum and the position of any given particle — the act of observing either one will alter the other. This, as you might imagine, can be very annoying for quantum physicists. Although inside a wormhole, this works in a slightly unusual way. Essentially, space is stretched, which causes more uncertainty than normal in a particle’s position. This means that the uncertainty in momentum has to be less, and the particle’s energy must be lower too. Particles are a bit like undergrads on a Sunday afternoon. They tend to head towards the lowest energy state they can find, so if they see somewhere with lower energy (such as a potential well in the case of particles, or a comfy sofa in the case of the undergrads) they’ll always head towards it. In other words, this new “force” will cause particles to move towards the region of curved space. Essentially, they find it a preferable place to be. Dandolo calls this a “quantum anticentrifugal force”. Personally, I’d argue that it isn’t really a force so much as an effect… But that’s just me being finickity. This entry was posted in Imported from Livejournal, physics. Bookmark the permalink.